Ahmed Adheeb Abdul Ghafoor (born. 11th April 1982) is the fourth and incumbent Vice President of the Maldives, since the adoption of the 2007 Constitution. Adeeb is also the Vice President of the ruling Progressive Party of Maldives (PPM). Adheeb completed his schooling at the prestigious Majeediyya School in Male’, before reading for his undergraduate degree from Staffordshire University. After graduating in 2007, Adheeb studied for an MBA from the Edith Cowan University, graduating in 2008. Upon his return to Male’ after higher education, Adheeb assumed the post of Chief Operating Officer at Millennium Capital Holdings Pvt. Ltd.. He was soon making a name in the local private sector boardrooms as an astute economic thinker and strategist, as well as a young commerce leader. In late 2008, Adheeb ran successfully for the prestigious post ofTreasurer of the Maldives National Chamber of Commerce and Industry (MNCCI), the primary independent umbrella organisation in the Maldives for local business and venture promotion. In 2011, Adheeb was elected as President of MNCCI at the age of 29. Adheeb stepped into the national spotlight in 2009 as a young analyst on primetime television, offering academic critiques on national economic policy matters. He was a strong critic of the then Nasheed administration’s economic and budgetary management record, and was a leading academic voice in the country calling for urgent macroeconomic reforms. After his secondary education, Adheeb served at the Maldives Customs Service, an institution at which his mother had served with distinction and dedication for many years. He served in various capacities at MCS from 2001 until he travelled overseas for higher education in 2004. Nine years later, Adheeb was asked by his party PPM, at the behest of the then Parliamentary Group Leader of PPM, Hon. Abdulla Yameen Abdul Gayoom, to join the Cabinet of President Dr. Mohamed Waheed Hassan, following the resignation of Mohamed Nasheed from presidential office midway through his five year term of office. Adheeb, who had played an instrumental role in advising the opposition on economic matters at the time, was identified by the party as a potential young star in Maldivian politics. The excellent relations that he had forged with private sector businesses in the country, during his stint at MNCCI, made him an ideal candidate for the crucial portfolio of Minister of Tourism, Arts and Culture, a responsibility he assumed on 12th February 2012. Adheeb, at 29, was the youngest member of President Waheed’s Cabinet. 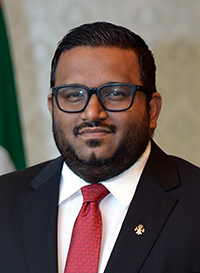 With the appointment, Adheeb also became the youngest appointment to the Cabinet of Ministers under the current Constitution. Adheeb’s leadership skills came to the fore yet again as he rallied the tourism and hospitality sector against attempts by the opposition to promote a tourism boycott campaign of the Maldives in some western markets. Adheeb’s pro-business policies and advocacy ensured sustained investor interest in the sector, and resulted in encouraging annual industry growth since 2012. A vital cog in the election campaign of the PPM’s presidential hopeful, Abdulla Yameen Abdul Gayoom in 2013, Adheeb worked tirelessly in fundraising for the Party, as well as being the architect of the PPM’s ambitious Economic Manifesto. Following the remarkable election victory for President Yameen and the formation of a PPM/MDA government on 16th November 2013, Adheeb was sworn in yet again as Minister of Tourism, this time for a 5-year term of PPM governance. Adheeb wasted no time in addressing the daunting task of transforming the national economy, with the encouragement and advice of President Yameen. He began the task of laying the groundwork of fulfilling each one of President Yameen’s key manifesto pledges, including the establishment of an over-sea bridge between the capital Male’ and neighbouring airport island Hulhule’, reclamation of the brand new extension to Hulhumale’ – the Youth City, and other mega projects envisioned by the President. He also played a key role in business and commerce legislative reform and transforming macroeconomic governance to inject much needed vigour into the economy, to promote foreign direct investment. Adheeb’s most notable contributions in the first 20 months of the PPM government included his role as Co-chair of the Economic and Youth Council of the Cabinet of Ministers, which included chairing daily meetings on important economic and youth empowerment policy decisions of the Government. He also served as the Chair of the Special Economic Zones Board. Adheeb has, from the onset, been a popular youth leader of the ruling PPM. With his successful election to office as the very first Vice President of the Party polling the highest among the three contesting candidates, Adheeb continues to be a popular figure among PPM supporters from across the country. He had travelled to all corners of the archipelago in the bid to elect President Yameen to the highest office in 2013. A strong advocate of President Yameen’s policies on youth empowerment, Adheeb has tirelessly endeavoured to support youth-driven activities, including in sports, music and arts and academia. His efforts have made him a youth icon, with record number of followers on Facebook and Twitter. Among the most recognisable media faces of the PPM government, Adheeb’s stock continued to rise nationwide, especially among the younger generations. Following the historic decision by the Maldives’ People’s Majlis to bring first amendment to the 2007 Constitution by capping the eligibility age for presidency between 30 and 65 years and thereby paving the way for a “youth” Vice President and the impeachment of Dr. Mohamed Jameel Ahmed from his Vice Presidency portfolio, Adheeb was appointed as Vice President on 23 July 2015. His appointment was endorsed by the People’s Majlis by a record majority of 78 out of 85 votes in favour. At the age of 33, Ahmed Adheeb Abdul Ghafoor entered the history books as one of the youngest ever vice presidents in the world. Adheeb is an avid footballer, having been earmarked at a tender age for his skills. He represented club and country in youth age groups before his academia took him away from a possible future as a professional. His other interests include water sports and adventure sports. He loves music and often plays the guitar in his spare time. His love for music also led to his sponsorship and event sourcing of the biggest major concert gigs in the Maldives, which included international artist Akon, as well as Bollywood stars and bands. Adheeb’s father served in the military and his mother worked as an executive at the Maldives Customs Service. Adheeb is married and is the dad of two children, daughter Aysha and son Izyan.